This is the twentieth in this series of 26 posts, one for each letter of the alphabet, that I am writing during the Blogging from A to Z Challenge, April 2016. You can find all the posts, as they are published throughout the month, by following the A-to-Z April 2016 tag. Testing for rank is almost universally done in martial arts. There are many benefits to following that system. Most obvious is that you know where you stand – how you are doing – and that can be very reassuring. It’s a chance to get clear feedback. Being promoted to the next rank is valid reason to be proud of your accomplishment. You’re being acknowledged for your diligent training and hard work. Another reason for rank is to know where others stand. Especially as a new student it’s useful to be able to seek out help from senior students, if you can figure out who they are. Rank is the instructor’s assurance that a person has met certain standards, both technically and in terms of participation in the dojo community. Finally, testing is a chance to run up against whatever is stopping you – and if it’s stopping you on the mat, it’s probably stopping you elsewhere in life, too. We each face our own obstacles – fear of being judged, fear of being inadequate, fear of screwing up. Maybe we’ve always told ourselves (or been told) we’re not physically up to something this taxing. Maybe have have an ongoing story about not having enough time. Where have these fears or stories stopped you in the past? This is your chance to stand up and face them. Demonstrate classic pinning techniques (ikkyo-yonkyo) from several attacks. Demonstrate several techniques of your own choosing from a given list of attacks. Demonstrate a set of weapons forms (jo and bokken suburi). Demonstrate weapons take-aways (jo, bokken, and tanto dori). 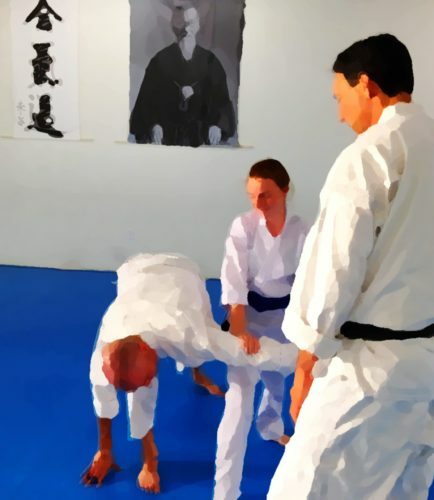 Demonstrate freestyle Aikido (jiyuwaza) with one or more attackers. If you’d like to see examples, here are videos of all of my exams, along with some brief commentary on each one. What’s expected on an exam? As important as technical proficiency is how to present yourself. Are you calm and grounded? Do you show proper etiquette. Do you execute the techniques with confidence and good posture? Are you staying present and connected with your partner throughout, not getting distracted by other things happening in the room, or rolling your eyes up in your head trying to think of how a technique goes? Do you lead your partner in the techniques (almost like dance, in that regard), drawing them in, entering into their movement as soon as they form the idea to move, or do you stand, frozen, until a strike almost hits you, and then react with a start? In some dojo exams are announced at the last moment. “Morgan, you’re testing today. Front and center.” Acck! I’m glad we don’t do that, but there are some good reasons for it. One could be that people don’t have time to get nervous and fret about it. But a more important one is that it encourages one to train every day as if the test might come at any moment – which is an idea very much in line with the kind of continuous attention we try to develop as martial artists. In some schools, you can opt out of testing. I urge you not to. It’s too valuable an opportunity to pass up. I find that I and others get a lot of benefit from the process of preparing for an exam. In our dojo we are told at least a month ahead of time (sometimes several months) that we will be testing. We know what we will be expected to demonstrate, so we can focus on polishing those things. We use a system of mentoring, typically working with someone at least 2 ranks above us. This gives the text candidate access to lots of personal instruction and one-on-one practice, and also gives more senior people an opportunity to begin learning how to teach others, not to mention having to expand their own knowledge along the way. During the period before our tests we typically train a bit more than usual, sometimes including open mat sessions and practice run-throughs with our mentor and others. There are, of course, the people who will be testing. They need to bring their practice up to the level of the next rank. This usually means getting a hundred questions answered about this or that detail of a technique, drilling them over and over until the body remembers how they go, and ironing out a thousand rough spots. Their mentors have to up their game as well. It’s easy to think we have a pretty good grasp of things, and then someone asks if a technique is done this way, or that way, and we find we aren’t sure at all. So there’s a lot of development on the mentors’ part during this process. Students of all ranks benefit throughout the intensive training leading up to exams, too. Beginners get exposed to more advanced techniques as they are covered in class. Everyone’s ukemi – skills in attacking and falling or rolling – gets pushed to higher limits during open mat and exam run-throughs, when things are done with more speed and power than we sometimes see in class. The instructors – senior students who teach some of our classes – get asked to present some material that we might not cover often. Like the mentors, these students have a chance to deepen their understanding of the techniques during this time, too. Even Sensei himself gets feedback on his teaching. He can see how everyone is developing during daily training, of course, including the instructors. And sometimes misunderstandings or uncertainties about techniques reveal themselves during the run-throughs, or on them exams. Throughout the process everyone involved is challenged and grows in some way. Just before our most recent exams (2 April, 2016) I watched Sensei go to the chalk board and write down the next exam date, 6 August, 2016. He listed below it the names of several people who will be testing. One of them, a woman who had just mentored a candidate for that very day’s exam came over and asked me if I’d be her mentor for August. As one group were feeling satisfied and relieved to have done their best, after the past months of focused work, a whole new batch of people were excited to be diving into the next months’ of intensive study and hard training. Roles change – the mentor now has a mentor. Some new folks step up to get more involved, and some back off for a while. Such is the cyclical nature of testing – it circles around, like the seasons.